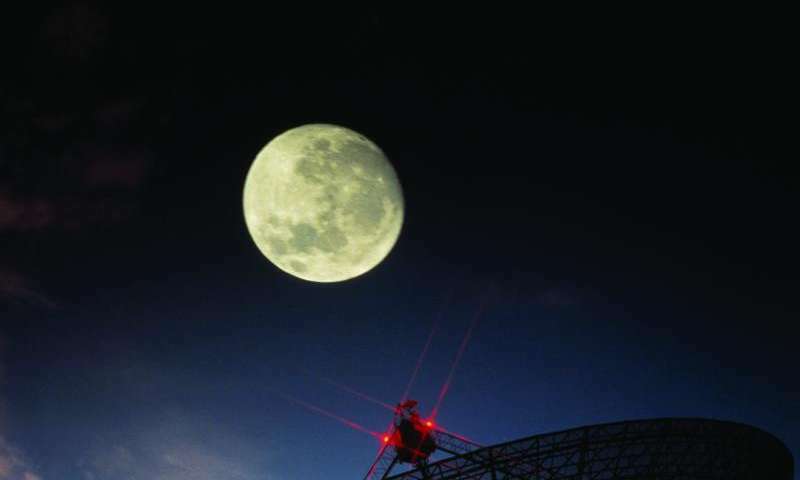 Using the moon and the GPS system, scientists have turned CSIRO's 64-m Parkes radio telescope in eastern Australia into a new tool for finding the highest-energy particles nature can hurl at us. The work is being presented this week at the 29th General Assembly of the International Astronomical Union in Hawai'i by CSIRO Fellow Professor Ron Ekers, on behalf of a team from Australia and Europe. The experiment the researchers carried out with Parkes was three times more sensitive than the best previous experiments of this type and paves the way for explorations with the future Square Kilometre Array radio telescope, which will start construction in 2018. "This is an exciting new way to tackle a difficult problem," Professor Ekers said. For five decades scientists have been baffled by 'extreme-energy' cosmic rays—charged protons and atomic nuclei—that are raining down on us from space. Carrying the energy of a well-served tennis ball, they are extremely rare, hitting Earth at the rate of one per square kilometre per year. Nobody knows what kind of 'cosmic walloper' generates them. "There are several explanations on offer, including exotic ones such as the decay of dark matter," said Dr Justin Bray of the University of Manchester, first author on the papers describing the work. The same processes that generate cosmic rays are expected to create neutrinos. Unlike cosmic rays, neutrinos are uncharged and are not deflected by magnetic fields in space. So detecting neutrinos would give us the direction of their source, and help pin down their origins. The Parkes experiment hunted for neutrinos in the highest energy range, above 10exp20 (a hundred million million million) electron volts. This is almost a million times more energetic than the neutrinos detected by the IceCube experiment, announced in early August. Extreme-energy particles are so rare that only detectors with a very large collecting area stand any chance of finding them. Yet the Parkes telescope can match the sensitivity of the best by using the moon as a very large detector. In the 1960s Soviet-Armenian physicist Gurgen Askaryan predicted that cosmic rays and neutrinos interacting with rocks under the moon's surface would generate a flash of radio waves lasting just a nanosecond. This flash is what the telescope looks for. It's a challenging experiment. Electrons in the Earth's ionosphere 'smear' out any arriving radio pulse, reducing its peak strength and making it more difficult to detect. Plus, stray radio signals produced by human activities—radio-frequency interference—could mimic the nanosecond flashes. But the Parkes experiment has triumphed on both counts. "We have effectively excluded all radio-frequency interference," said CSIRO's Dr John Reynolds, a member of the research team and former head of the Parkes Observatory. And in a unique approach, the researchers used the timing of signals from the GPS (global positioning system) satellites to measure the changing electron density in the Earth's ionosphere, hour by hour, and used this to correct for the 'smearing' effect. As a result, the Parkes experiment was "able to detect radio pulses three times weaker than previous similar experiments would have picked up," Dr Bray said. The researchers have set the best published limit on the number of high-energy (10exp20 eV) neutrinos coming from the direction of a galaxy called Centaurus A, which some evidence suggested would be a strong source of cosmic neutrinos. Limits at these very high energies constrain a number of exotic models such as 'topological defects' in the formation of the Universe. The specialised hardware developed to detect nanosecond pulses for the Parkes experiment was funded as a Discovery Project by the Australian Research Council. The signal-processing performance of the Parkes system was near the theoretical maximum, with 99.6% efficiency. But Parkes can only see part of the moon in a single 'look'. "To go forward we need a telescope with a wider field of view, one that can see more of the moon at once," said Dr Clancy James of the Erlangen Centre for Astroparticle Physics in Germany, a member of the research team. One way to get this would be to equip Parkes with the new type of instrumentation (a phased array feed) that CSIRO has developed for its Australian SKA Pathfinder telescope in Western Australia. Even better will be the international Square Kilometre Array (SKA) itself, which is set to begin construction in 2018. A workshop to explore the instrumentation the SKA would need for carrying out this kind of experiment was held in Manchester in May this year, and the proposal was put forward at the International Cosmic Ray Conference in The Netherlands earlier this month. "Radio in general is now an accepted part of cosmic-ray studies," Dr James said.